2018 The 12th Annual Skate the Lake saw the addition of Rock the Lake (curling on the lake). The $12,000 donation from the 2018 event went to Minnedosa Minor Hockey towards their planned purchase of a digital score clock / display. 2017 Skate the Lake 2017 donated a total of $10,000 to two community organizations: $5,000 to the Beach Enhancement Committee and $5,000 to Minnedosa Minor Hockey for sound system upgrades at the arena and coaching supports. This was our warmest Skate the Lake to date with temperatures of 5 degrees on Saturday, causing some games to be relocated to the arena due to standing water on the ice at the Lake. Sunday was still above zero (1 degree) so morning games were at the arena to preserve ice conditions for the afternoon final games. Our 10th Anniversary Skate the Lake! We are please to announce our largest donation ever - $12,700. 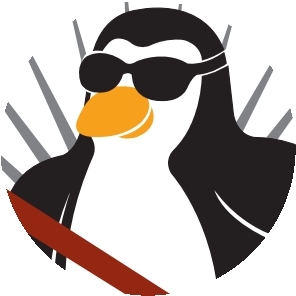 For our 10th anniversary we gave a special salute to our gold sponsors (pictured below). Although the weather was a little cooler on Saturday it didn't slow down our pond hockey players. With a total of 49 teams (24 youth teams (11 from out of town); 19 mens, 6 ladies ) our ice maintenance crews were busy keeping the ice ready for all of the games. The 9th Annual Skate the Lake donated $12,000 to support Minor Hockey project at the MREC facility. 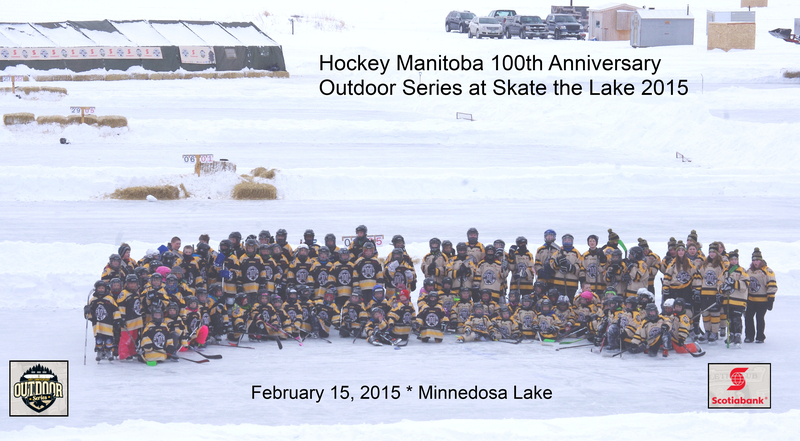 We were also the proud hosts of a Hockey Manitoba 100th Anniversary event - the largest number of concurrent pond hockey games hosted in the provice that day with over 150 minor hockey players participating in the Outdoor Series. 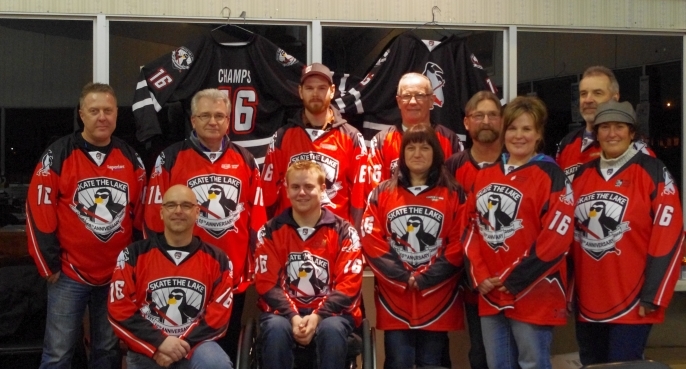 Minnedosa Minor Hockey was able to raise just over $11,500 at Skate the Lake 2014. These funds have been designated/ear-marked for Minor Hockey related projects at the new MREC facility. This brings our total fundraising efforts for this project over the last 6 years to almost $40,000. In 2013 the Minnedosa Minor Hockey teams and families worked together to raise $7000, which was donated to minor hockey related projects at the proposed MREC facility. 2012 $7,000 was raised by the Minnedosa Minor hockey teams and families through Skate the Lake 2012. This amount was donated to the MREC fundraising committee. 2011 Once again, Skate the Lake was operated by the families of Minnedosa Minor Hockey. $6,800 was donated to MREC from the weekend. 2009 After Skate the Lake 2009 a donation of $4,500 was made to the Minnedosa Community Childcare Cooperative. 2008 In 2008, Skate the Lake was able to donate $2,500 to the Minnedosa Community Childcare Cooperative daycare project, despite having to reschedule due to the extreme weather on the original weekend. The “Skate the Lake” kids present a cheque for $3,200 to Rhonda Curle and Norma Gordon with the Minnedosa Daycare Committee. The organizing committee, with the help of their kids, were thrilled with the amount raised.